It’s small, silent, cheap to purchase and (most places) legal to carry. It never runs out of ammunition, cuts through clothes and body armor, and slices everything in its path in a way that bullets only dream of. I’m about to share the most important “gems” I’ve learned since I started studying Filipino knife fighting over 20 years ago with Master Instructor Mark Mikita of Fightology in Los Angeles. While no article can replace years of training, my goal is to give you the info you need to help tilt the odds in your favor if you are ever attacked by someone with a knife. 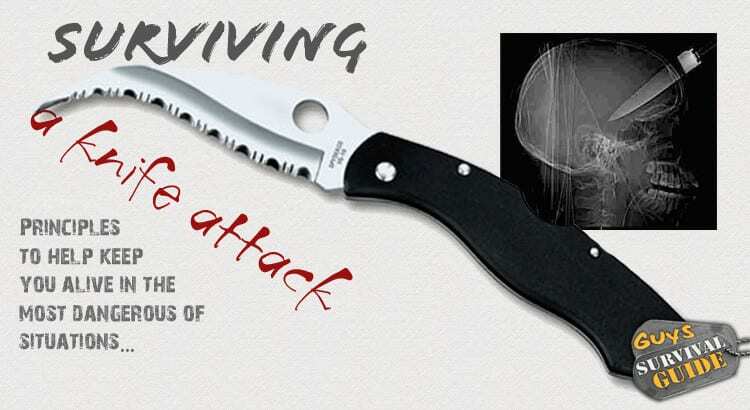 Knives are superlative weapons for the close range where you’re most likely to be attacked. Life-or-death scenarios don’t usually start at 21+ feet – which is the minimum distance a person with a gun needs to deal with an assailant with a knife. Myth Busters even did a show verifying this. (As a matter of fact, one study showed that even 21 feet may be insufficient). Most altercations take place with six or seven feet between the two combatants Essentially one pace… A fraction of a second in distance. At these ranges, the knife is a an extremely effective and terrifying weapon… a person with a knife will be on top of a person with a gun, stabbing away, well before the gun is drawn, aimed and fired (much less cocked if it’s not already). The knife is, for all intents and purposes, the ultimate personal defense weapon for every-day circumstances. And when you start looking for them on other people, you’ll be surprised just how many people are out there carrying knives. Which makes it a VERY important thing to be able to defend AGAINST. But the whole reason I trained in martial arts in the first place is that, at times, I found I was in a position where leaving wasn’t an option… For example, situations where I stepped in to defend someone else… And when you can’t leave, you’ve got to have a plan. If you’re going up against someone with a knife, things are certainly grim. However, there are things you can do to help increase your chances of survival. 1) CARY AND LEARN TO USE A KNIFE. The first thing you can do to tilt the odds in your favor is level the playing field. This turns a “wolf eats sheep” scenario into a “wolf fights wolf” scenario… You’re still at risk, but at least you’ve gone from 99/1 to 50/50 chance of survival. Now some people are squeamish about the idea at first, afraid that a knife is somehow an invitation to trouble, or that they’ll hurt themselves instead. As pointed out earlier, you’ve probably used a knife on a near-daily basis for most of your life. The idea that it could be “taken and used against you” is also silly… Unless you’re fighting a well trained knife fighter (.002% chance), they won’t know how to disarm you, and all they will have to grab onto is razor-sharp blade. Once you start carrying, I guarantee you will quickly adjust to having your “little buddy” with you, and you’ll start to notice just how many other people are also carrying knives… That’s when you’ll realize you’re not paranoid, you’re being smart… And before long you’ll feel naked going out without a weapon. After all, a knife is just a good bit of insurance. This falls under the “I’d rather have it and not need it, than need it and not have it” category. If you never need to use your knife on another person, then kudos! 2) NEVER TURN YOUR BACK. As with virtually all fight/attack/defense situations, NEVER TURN YOUR BACK. Your arms are designed to swing in one direction: forward. When you are crouched over in a typical “shelled up” position, all your ‘weapons’ are facing inward protecting you… If you are 100% on the defensive, your attacker can be 100% on the offensive… They can stab you over and over and over and there’s nothing you can do from a back-turned, shelled-up position. The temptation is strong, but this position is the worst possible. 3) DISTANCE IS TIME. Anything you can do to create time for yourself to change the scenario can save your life. If you can put distance or obstacles between yourself and your attacker, you can buy time and potentially change the scenario entirely. For example, circling behind a car, forcing them to play “chase” can buy you time and potentially an opening to either run away, have the cops show up, find a weapon, or have the guy change his mind, etc. Buying time with distance and obstacles can save your life. Note: Thus far, all the improvised weapons I’ve mentioned allow you to counter-attack and distract from a greater DISTANCE. They’re longer range weapons than a knife, and keeping your attacker out of range is KEY. A ballpoint pen is a great stabbing weapon, and a broken bottle or box cutter is a great slashing weapon, but they’re examples of ‘last resort’ improvised weapons, as they allow your attacker within range to stab and slash your vital targets with their knife. 5) PROTECT YOUR VULNERABILITIES. If an incoming knife attack is imminent, you need to do whatever you can to protect your major veins, arteries and vital organs. As I explain in my article on “Attacking The Anatomy“, your body is designed so that the outward facing regions (tops of forearms, outside of upper arms, outside of thighs and calves, and back) are all highly armored with musculature. 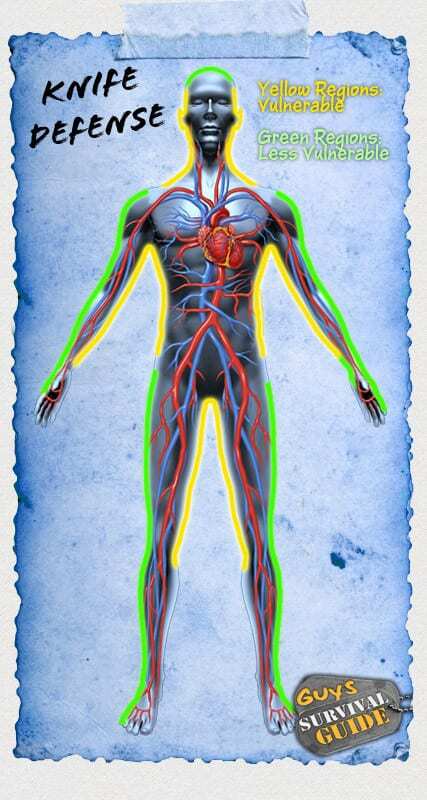 Meanwhile, your vulnerable veins and arteries run along the inside of your arms and legs… You must protect these and your throat and clavian and sub-clavian arteries from being cut… Lest you should meet your demise by springing a rather large leak. This means that if you must take a slash from a knife, you want to present the backsides of your forearms… These are also the muscles that control the opening of your hands… Whereas the underside of your forearm is what controls the closing of your hands… Meaning your ability to grip your own weapon and to grasp their attacking hand and weapon. You don’t want this area cut! If you have the opportunity while using the concept from principle 2 (gaining time using distance and obstacles), you can use a shirt, jacket, belt or other material wrapped around your forearm to create a sort of insulating shield. This will be less effective against a serrated knife, but is still better than nothing… It will also serve as a bandage to help slow and control any bleeding if you do get slashed in that area. 8) ALWAYS EXPECT THE BLADE. Once things get ugly, you must never let your guard down. They may have more than one weapon, or friends who are walking up on you. Even if you seem to have neutralized someone, or gotten away from them, it’s not over until you are well away from harm. I once had an gang-banger who charged me in a parking lot over his own road rage. he launched at me with virtually no warning or ‘interview’… So I struck him in self-defense with a straight shot to the face that left him on the ground dazed. When he got up, I told him to get in his car and have a better day, and not to come at me again. I got in my car and drove off while he was still trying to figure out what to do. I checked my rear view mirror carefully and drove two blocks to a different shopping area so I could call the police and file a report (my cell phone was dead). I got out of my truck and started walking when I saw this guy pull up and pop his trunk. Had I not been vigilant, I could likely have been hit in the back of the head with the tire-iron he came at me with. So remember, it’s not done until it’s done. Be safe, keep your eyes open, and above all else, if you have the option to leave the situation, leave. P.S. : Yes, I survived the tire-iron attack as well… It never happened. I had my Eskrima sticks in my car, so I pulled them out and made a display of twirling them a bit… And informed my would-be attacker that I was done playing games. Another important thing to remember: willingness is often more important than skill. Thanks to years of training with my instructor Mark Mikita, I love stick-fighting and this guy could see that I had no fear of his tire iron… this was my game now, on my terms. He asked me one final question before he left: “Who’s gonna fix my toof?”. (I had knocked it out with that one straight shot). My answer? “You should thought of that before you attacked a complete stranger for nothing.” Important words to consider for anyone thinking to fight with someone you don’t know. My advice: avoid fighting unless the fight is brought to you . You’re never sure just who or what you’re up against. I was wondering if you can give me any advice. Recently i have been getting some trouble from a few teenage boys. (i”m a 13 year old girl. While i hate too say it my family are very well off and i get more heat than the other girls). They all cary knives. They hero worship a few older guys (30,40 year olds) and the older guys tell them to leave me alone but when they aren”t around the boys are much more confidant. Do you have any tips to take the edge of them? ps i come across them in a area i cant bypass. Get some Pepperspray (Sabre Red Mk-3) or/and an Spyderco Matriarch 2, learn how to use it, and show no signs of fear: remember, willingness is often more important than skill. Better use Pepperspray if you have to, because after the Stituation the Court stands before and Knives are in their eyes “Criminal Weapons”…. I disagree wholeheartedly. Again, I’m not an attorney and not giving legal advice, BUT pepper spray has many shortcomings… It can rapidly escalate a situation, there can be a delay before it really kicks in (think of eating a pepper) and there are a decent percentage of people who are simply not going to be that terribly affected by it. I would rather have my day in court, ALIVE, and assuming I was really defending myself, explain that… than be dead. If someone is willing to attack you while you’re holding a knife, they’re almost certainly willing to kill you if you did something else like try to kick them in the testicles or spray them with pepper spray. Same response goes for stun guns. Jane, you ABSOLUTELY need to alert your parents and the police. This is a VERY serious situation that can get out of control quickly. I don’t provide legal advice, but I will say that this is NOT a situation to be handled by learning a technique or some skills… People learn techniques and skills to deal with the unknown. In your situation, you have a KNOWN dangerous situation. You’re legally a child, and the first thing you should do is tell your parents about this situation, and I would strongly urge your parents to talk with law enforcement. Teenage boys carrying knives harrassing you is a VERY serious situation. You are absolutely correct. Leave the ego out of the equation. Any way that you can, avoid the confrontation. Even when you “win” the “encounter” there may be additional headaches. If I could tell, where and when trouble was looking for me, I would take a plane and would be 1000 miles away. However on the other hand, once I assessed the situation,( and all the time that is available is a few seconds) and there is no way out, I look for instant neutralization. I carry two guns and two knives. The guns, one is a 10mm and the other a 45 ACP, ( these calibers help a little in dealing with the lack of distance, but you must have it ready. It is not a 12 ga slug, but multiple hits at a close range, can deliver relief) my knives are well known brand. One amazing thing is the reaction by the side looking at the business end of a gun. Suddenly, common sense and reasonableness becomes their main trait. By all means avoid getting hurt, first by far, by not entering, second, by not having any enemies in any position to be a threat any longer. It is not knock, knock, it is Glock, Glock.